While Agents of S.H.I.E.L.D.’s second season is still on winter hiatus, Agent Peggy Carter has stepped up to fill the blank scheduling as well as many gaps in the Marvel Cinematic Universe. Though it’s not just her role in the MCU that makes this show important; but also seeing these incredible characters on their own merits and how they cope in a Post WWII world. So let’s jump right into it and get a closer look at everything this series premier had to offer – new plot, old references, Easter Eggs and the overall importance of the series. Right off the bat, Agent Carter is an enormous step for being the first superhero show in decades that is centered on a female lead. What’s even more impressive is that Peggy Carter has no superpowers of her own. This series is about Captain America’s right hand girl not only setting up the foundations of S.H.I.E.L.D. ; but also trying to overcome the inequality and sexism of her times. There’s so much to love about this show and this character. That is exactly why Peggy Carter was brought back for a Marvel One-Shot mini-film after people fell in love with her during Captain America: The First Avenger. Even a cameo in Captain America: The Winter Soldier, Agents of S.H.I.E.L.D. and even a rumored appearance in Avengers: Age Of Ultron and Ant-Man aren’t enough. 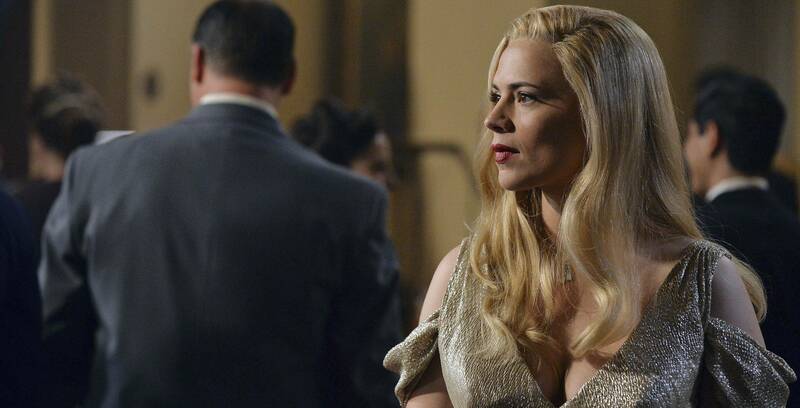 She truly deserves her own series, and Agent Carter does her justice on so many levels. These are all points we’ll explore throughout these articles, as well as Agent Carter’s role in bridging the gap between Captain America: The First Avenger, Agents of S.H.I.E.L.D.’s Second Season and Ironman 2. Immediately following Captain America’s final battle with Red Skull, Peggy and the Howling Commandos led an assault against Colonel Reinhart (as we saw in the premier of Agents of Shield’s second Season) and captured many of his weapons/relics, placing them under the protection of the SSR. The SSR – the Strategic Scientific Reserve – is the precursor of S.H.I.E.L.D. as was where Peggy returned to work after the war. Though sadly, this time also coincides with a lot of the sexism of the times, which I’ll get to in a moment. This mini-series will end with Peggy restoring Howard Stark’s good name, which will then allow him to call upon Peggy to help him form S.H.I.E.L.D. (Marvel One-Shot). Any possible talk about meeting a young Hank Pym or seeing the Stark’s murder would be up for exploration IF there is are further seasons. Though for right now, this mini-season of Agent Carter will focus on the time between Marvel’s Agents of S.H.I.E.L.D. 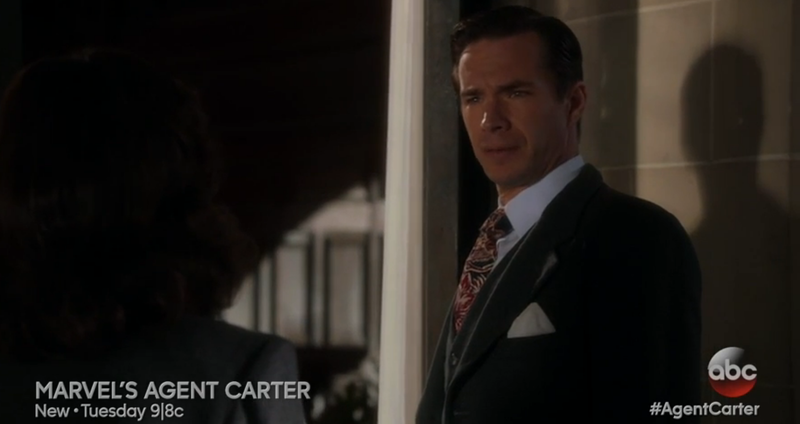 (Season 2) and Agent Carter’s Marvel One-Shot. 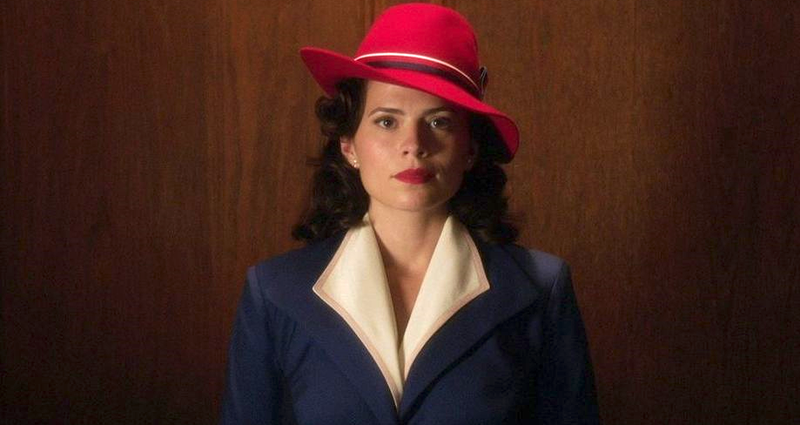 The War might be over for Peggy Carter; but it seems as though her true battle begins. With the weight of Steve’s death still weighing heavily upon her, there is nothing more she wants than to just throw herself into her work. The only problem is that it’s the Post-War 1940s – and you have to know what the means to truly understand this show. While the war was going on and many men were sent away to fight the war, women were able to take over many jobs they would have never been considered for prior. Though with all the veterans returning, this pushed them back into the usual secretary, waitress, etc jobs that they were accustomed to before these times. The era of Rosie the Riveter was over, and the expectation for women returned to being ‘good and proper ladies’ that should just go find a husband – or worse, helpless damsels. As if witnessing – and dealing with – sexism, belittlement and sexual harassment everywhere she goes wasn’t enough, Peggy now must listen to the Captain America radio program featuring ‘Betty Carver’. You see where this is going right? Much like the times itself, this radio program couldn’t imagine a woman fighting alongside Captain America, so they reduced Peggy Carter into Betty Carver, a damsel in distress nurse rather than an ace marksmen spy/soldier. This radio broadcast is her legacy and public fiction or not, the men at the office all think it to be true; or worse call Peggy nothing more than one of Captain America’s ‘play things’ – which simultaneously dishonors her and Steve Rogers himself. So amidst all this, it’s easy to see why Peggy was all too happy to help an old friend. Howard Stark is many things, but he’s no traitor. After being accused of selling weapons to enemies of the state – probably Russia – Howard Stark is on the run from the SSR while Peggy Carter and his faithful and sarcastic butler Edmund Jarvis try to clear his name. Though what’s most impressive here is just how much Howard is like his son Tony. We already knew he’s a bit of a womanizer and loves his alcohol; but did you also know that Howard had a sub-office vault full of his most dangerous inventions – ‘bad babys’. He couldn’t not invent these things. When the idea comes to him, he just has to invent and then seal it away. Wait a second, a sub-office vault in which a bunch of weapons – that he couldn’t help but invent – are housed. This is EXACTLY what Tony’s ‘wine cellar’ in Ironman 3 is, a vault composed of various armors he built while coping with his PTSD after the Battle of New York. The ideas all came to him and he had to build them, just like his father. Another funny likeness comes when we see Howard on trial and poking fun at those accusing him much like his son did in Ironman 2. Though there’s actually one more link to Ironman 2, and it’s the reference to Monaco. While in Monaco, Howard’s vault was broken into and that is how all his trouble began. The last time Tony was in Monaco is when Ivan Vanko attacked and started the bulk of Tony’s troubles for Ironman 2. This Monaco would become even more potent if it turns out that while in Monaco, it was Anton Vanko – Ivan’s father – who screwed over Howard. 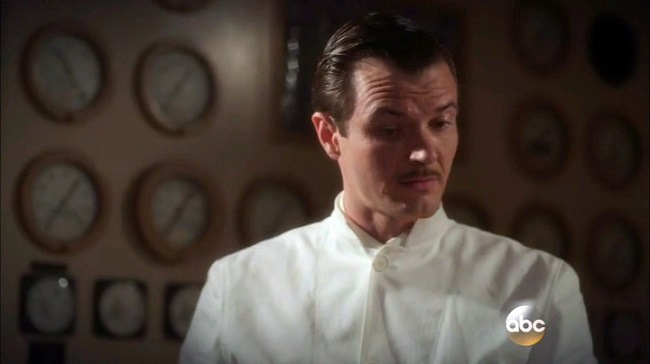 Okay, I’m calling it now – as I’m sure other are: Anton Vanko is going to be connected to this ‘inside job’ of framing Howard Stark. You remember Anton Vanko right? He was the dying alcoholic at the beginning of Ironman 2 who was also the father of that films main antagonist, Ivan Vanko. What we know from that film – if you remember – is that Anton was an incredibly brilliant physicist who helped research new sources of energy and invent the arc reactor; but also sold many secret secrets to the Soviet Union. So when Peggy and Jarvis ask Anton for assistance with tracking Tony’s missing Molecular Nitramene, it’s entirely possible that they are going to the very person who helped set these events in motion. Then again, there is a much larger “big bad” coming this season. So rather than see Anton Vanko try to screw Howard over and get deported, we could see this brilliant physicist actually begin to turn as he helps the evil organization, Leviathan. Remember Hydra, the crazy applied science organization born from Hitler’s Nazi? Well Leviathan is more or less the same thing, except born out of the Soviet Union. Beyond that, not much is really known about this organization – at least from the comic standpoint. Much like Hydra, they are very concerned with cutting edge weapons and alien tech. In several cases, they even face off with Hydra and S.H.I.E.L.D. in a huge battle royal. Though considering S.H.I.E.L.D. 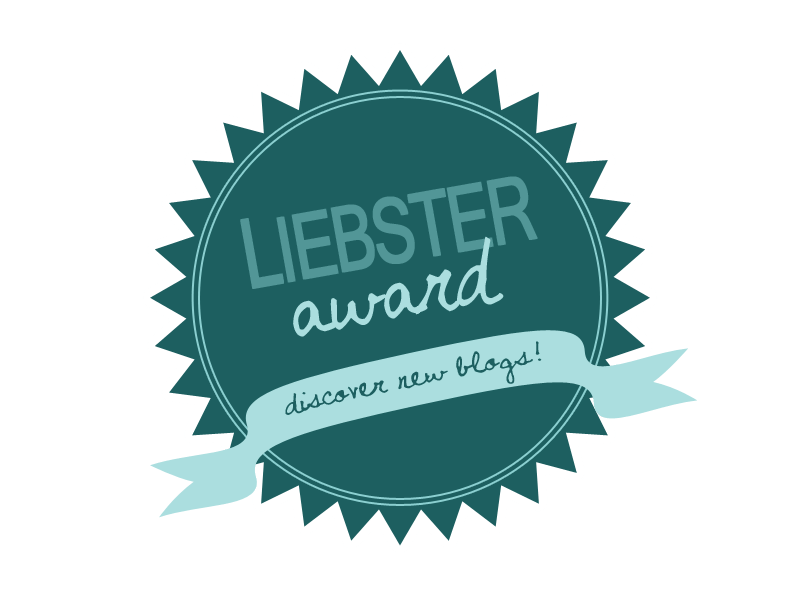 hasn’t been formed yet, this might not happen yet – or just slightly changed. 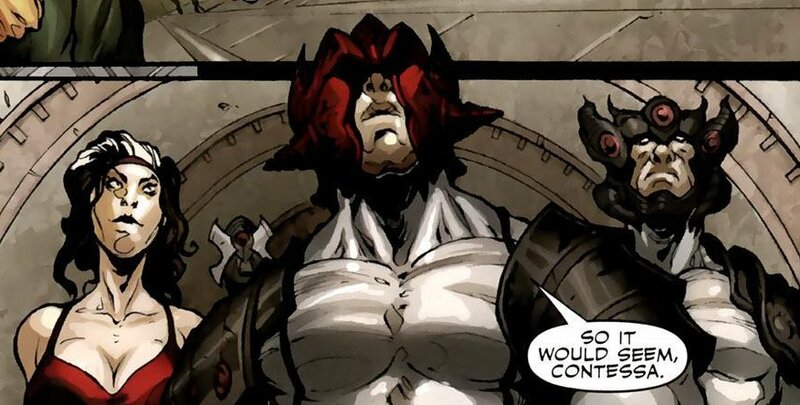 Anyway, the main story for this organization is how they tried to recreate the Super Soldier serum by using alien tech on themselves, however this horribly backfired when their power source was removed and they all turned into monsters. Again, whether the alien tech and ‘turning into monsters’ happens this season is doubtful; but this could very well be why they want Stark’s tech – the power source to supply that initial experiment, at least until Agent Carter or someone else intervenes. In fact, seeing this miniseries end with merging as deformed monsters could be a great set up for a season two. Despite any possible future story plans for them and any comic counterparts, we can at least tell that they are indeed very similar to Hydra at least in the way they treat their followers. If you thought the Hydra cyanide pill in the back molar was a drastic way to keep someone quiet, Leviathan has its followers undergo a laryngectomy – removal of the voice box – so that they can’t speak without the aid of a device. While in her blonde disguise, Peggy is asked to dance to which she responds “I’m afraid I’d only step on your toes”, which is very similar to Captain America’s last words to her. Peggy’s coworker Daniel Sousa might seem like the only guy in the office who isn’t a huge jerk; but did you know we’ve seen him before. Well, not him; but his actor Enver Gjokaj did appear in the Avengers as a police officer with Captain America. Then again, knowing Marvel, maybe these two are connected. Either way, this is one person in the running for ‘Mr Peggy Carter’ – all we need to hear is how he got injured and if Captain America saved him once. Ironically enough – if it is him – then Captain America would eventually save him … in The Avengers. The power plant destroyed by Howard’s stolen Molecular Nitramene is owned by Roxxon Oil, which has itself not only appeared in Ironman, but is also connected to the murder of Stark’s – at least in the comics. Not really a hidden Easter Egg; but the VitaRay Device Peggy uses to track Stark’s Molecular Nitramene was one of the devices used in Project Rebirth by Dr Erskine in Captain America. Additionally, Dr Erskine serves as yet another example of someone whom Peggy feels she couldn’t protect. So where to from here? Well for starters, we know that the SSR is now in possession of Peggy’s Keychain and know it belongs to this ‘mysterious blonde woman’ they’re after. Further more, what could that sideway ‘B’ or ‘Heart with a line through it’ represent? Was that all there was to it or did he die before he could finish? Though whatever this all means there is one VERY pressing issue coming up: the license plate. If you remember, the license plate from Stark’s car was ripped off in the Roxxon Oil explosion. Sure the car was ditched; but the plate would still lead back to the Stark residence – and Jarvis. It looks like the SSR will have some questions for Jarvis in next week’s episode. So be sure to subscribe and check back here for another installment of Declassified to get a closer look at Agent Carter. didn’t think 90’s action would be so intresting! marvel allways find a way to make there shows adictive.. It was so idiotic of them to give flashbacks of Agent Carter one shot. This isn’t The Flash. And though I wonder if they will try to cover Avengers guard story into a patsy. Though a cool serial, it only needs to stop repeating the mistakes of the x men franchisee. You missed an easter egg. Leet Brannis appeared as a thief in one issue of All-Winners back in the 40s.